Coke produced a number of soft drink cap sets in the late 1960s, featuring both individual teams and league All-Stars. 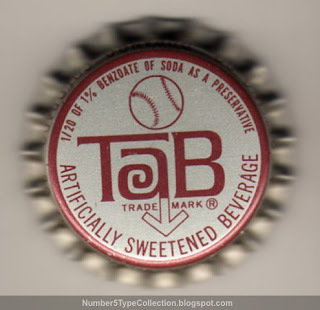 Adding baseball promos to Tab (their original diet cola) was just one way of spreading marketing dollars around the many Coca-Cola brands. Surprisingly, he's the best-known player from 1967's set. Koufax retired after 1966, Drysdale curiously doesn't get a cap, and few other members from their 8th-place squad made a lasting impression. I love this bottle cap. (There, I said it.) The classic 1960s design, stitched baseball, and blurry/sharp mix look very pop-artistic. Check out the 1967 Dodgers gallery at Philly Sports Cards. 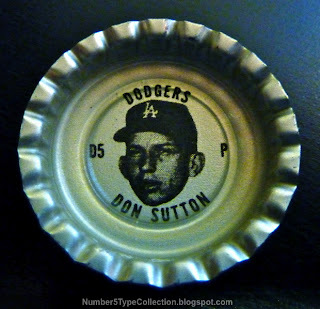 They carry a variety of Coke bottle sets and that's where I bought my Sutton cap (and a few others for future posts). Value: $12 got me a pristine HOFer, about the high water line for Coke or Tab caps. Common players in lower grades run $1 or less. Fake / Reprints: Fortunately, I doubt it's possible to fake a bottle cap.